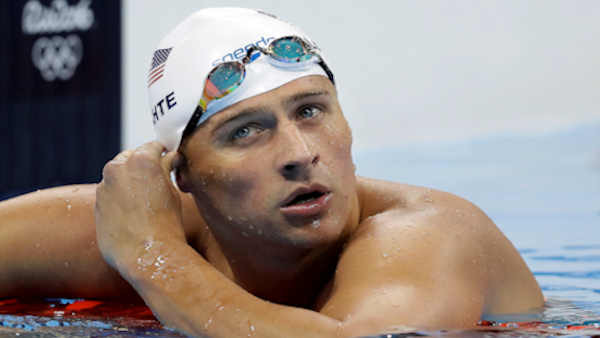 RIO DE JANEIRO -- Ryan Lochte and three other American swimmers were robbed at gunpoint early Sunday by thieves posing as police officers who stopped their taxi and took their money and belongings, the U.S. Olympic Committee said. In the latest security incident to hit the Rio de Janeiro Games, Lochte told NBC that one of the robbers put a gun to his forehead before taking his wallet and cellphone. No one was injured. Lochte took to Twitter Sunday evening, thanking everyone for their support. "Their taxi was stopped by individuals posing as armed police officers who demanded the athletes' money and other personal belongings," USOC spokesman Patrick Sandusky said in a statement. "All four athletes are safe and cooperating with authorities." "We got pulled over, in the taxi, and these guys came out with a badge, a police badge, no lights, no nothing just a police badge and they pulled us over," Lochte told NBC's "Today" show . "They pulled out their guns, they told the other swimmers to get down on the ground - they got down on the ground. I refused, I was like we didn't do anything wrong, so - I'm not getting down on the ground. "And then the guy pulled out his gun, he cocked it, put it to my forehead and he said, 'Get down,' and I put my hands up, I was like 'whatever.' He took our money, he took my wallet - he left my cellphone, he left my credentials." USA Today and Fox Sports Australia first reported the news, citing Lochte's mother, Ileana Lochte. Ileana Lochte and Lochte's agent did not immediately return phone calls and text messages from The Associated Press.